For my 12th birthday party, me and several other people that I know watched the brand new Star Wars movie Rogue One. It takes place between episodes 3 and 4, right before A New Hope (the first ever made movie). My actual birthday was on December 12th. The movie came out that following Friday (the 16th) but we watched it the day after. I think it was awesome and will now do a movie review about it! I rate it 4.7 out of 5 stars because I do not consider it to be as good as The Force Awakens, which I rated as 4.8 out of 5 stars. The actions scenes, in my opinions, were way better but I rated it less because of something that would be a spoiler. Basically, something happens in the movie that I was surprised about. I guess that the reason Disney made this happen was to contribute to the moral of the story being sacrificing for important causes is worth it, but I still don't think it was necessary for this to happen. Or it could rather just be the movie producers being plain lazy. After all, if they hadn't done it, then they would need to make references to Rogue One later on in other Star Wars movies, and it would be too much for them to handle. Other than that, it was an epic movie and I would have considered it the best Star Wars movie yet if not for this downfall. The introduction to the movie takes place when the main character Jyn Erso is still very young, probably 4-7 years old based on the actor for it. 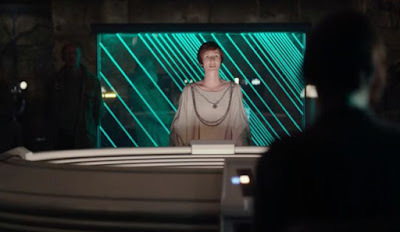 Her father, Galen Erso, is a brilliant energy scientist and the Empire thinks that his knowledge would be useful to them. So they force him to join the Empire. Director Krennic and a squadron of death troopers hunt the Erso family down, and destroy their home. They take Galen away. 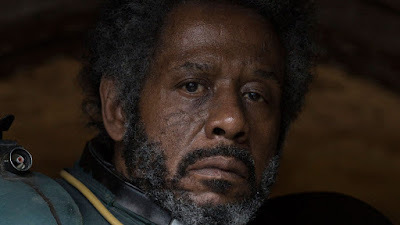 Before this happens, Jyn's mother, Lyra Erso, tells Jyn to go into hiding in a certain bunker they have prepared just in case this situation ever happened. So she runs to the bunker and stays inside for several years. She survives from a special backpack with medical supplies and a large amount of food in the bunker. She is eventually found by a man called Saw Gerrera, who is part of a Rebel extremist military. Saw simply tells her, "Come, my child... come here with me. We have a long way to go." She climbs out of the bunker and then the scene stops there. It then continues when Jyn is a older, probably over 20 years old, and she is in an Imperial prison camp. 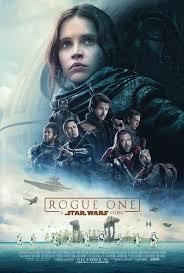 A group of Rebels lead a rescue mission for her, lead by Captain Cassian Andor. Jyn still resists this, and attacks the rescuers. 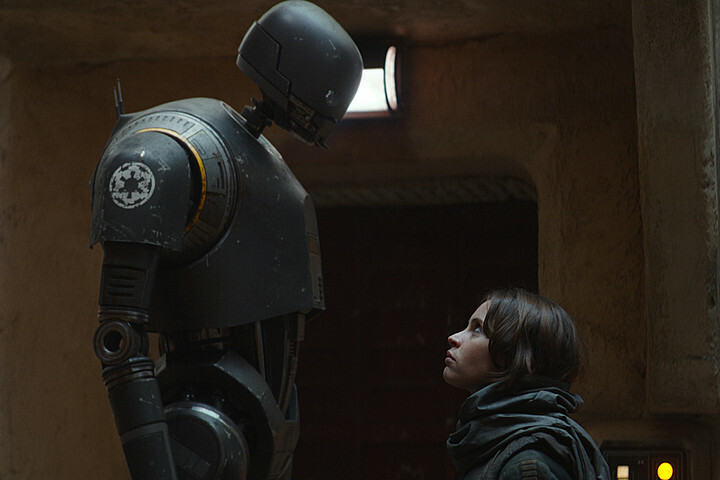 She is stopped by the droid K-2SO, who tells her, "You are being rescued. Please do not resist." She is brung into Rebel headquarters, where she is greeted by Mon Mothma. Despite her criminal record, they allow her to join a mission to find Galen Erso. This is because she is the only one who would recognize and be able to reason with him. Galen Erso is secretly a traitor to the Empire, and has put a weak spot in the middle of the Death Star plans. Once the Rebels have the plans, they will know how to blow up this superweapon. Jyn Erso, Cassian Andor, and K-2S0 are joined by many other characters. These include Chirrut Imwe, a blind man who uses the Force to help him fight with his staff, Baze Malbus, a gaurdian who is skilled with weaponry, and Bodhi Rook, a skilled Imperial pilot who defected from the Empire to join the rebels. This turns out to be a lot harder than they think, and they end up coming face to face with Darth Vader and the wrath of the Emperor. Will they succeed in stealing the plans? Watch the movie to find out! That is the end of this post. Thanks for reading.